Kick comfort into high gear with the HomCom Race Car Style High Back PU Leather Reclining Office Chair with Footrest. It allows you to get comfortable and stay productive for the best of both worlds. With a 0-180 degree adjustable backrest, 360 degree swivel function, adjustable seat and armrest height, retractable footrest and a sturdy metal base with smooth rolling castors, it's got everything you need to get comfortable and stay productive. Here at HomCom we may not be able to lessen your workload, but we are able to make your workday more enjoyable. 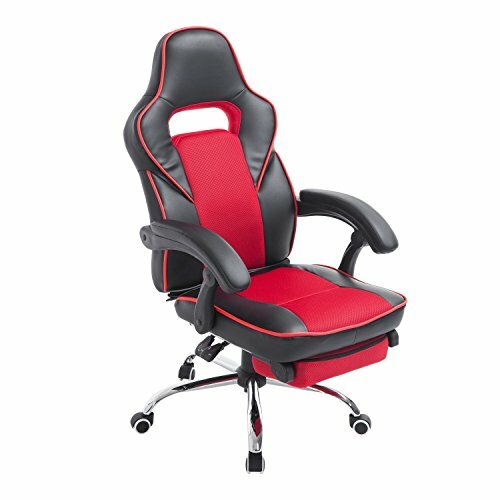 - Seat Surface Adjustable Height: 19"- 22"
- Armrest Height Adjustment: 26"- 29"
- Overall Height Adjustment: 46"- 48"